When I think of buckwheat, I used to think of buckwheat pancakes and gluten-free flour. 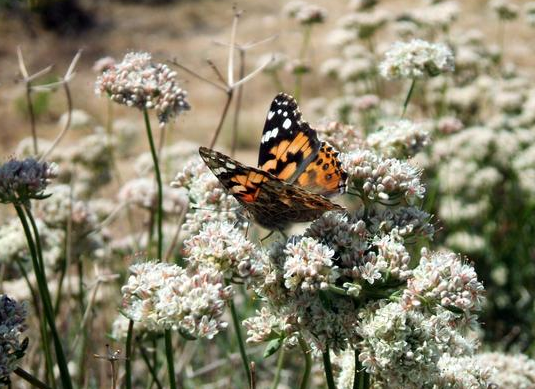 This is not your native California buckwheat. 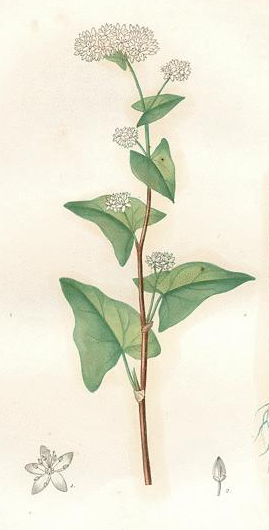 The former (genus Fagopyrum) is a fast-growing native of Europe, the seeds of which are good for making pancakes, breads and salads, as well as for a garden cover crop. It is an annual (it survives for only one growing season) with bright green heart-shaped leaves and pinkish-white 5-petaled flowers. 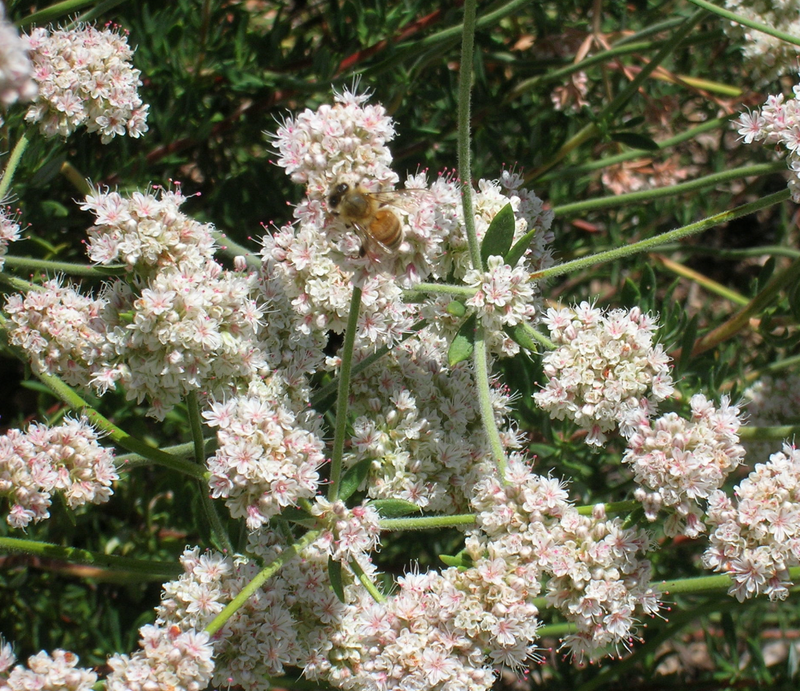 The latter (genus Eriogonum) is a genuine California native that is really good for birds, butterflies, bees and other insects, and as cover for lizards. 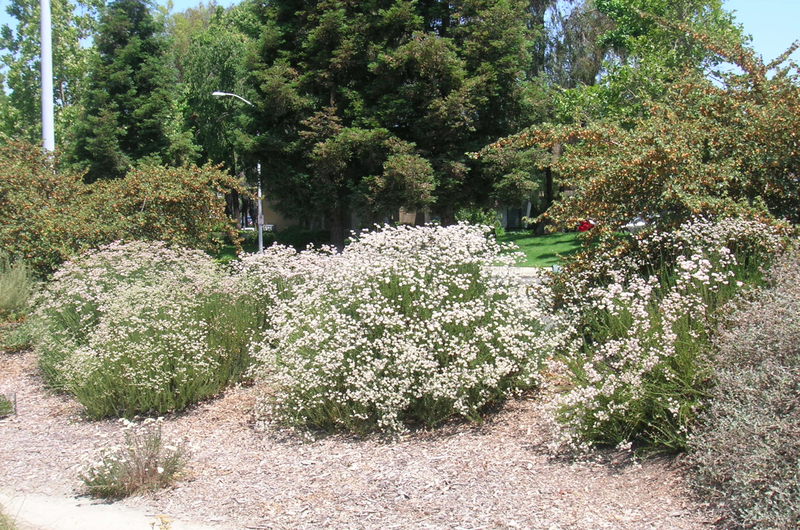 So if you want to attract these fauna to your yard, plant a native Califor- nia buckwheat. It is an evergreen perennial, so it remains green and verdant year after year. We have four species growing here at the Granada Native Garden. 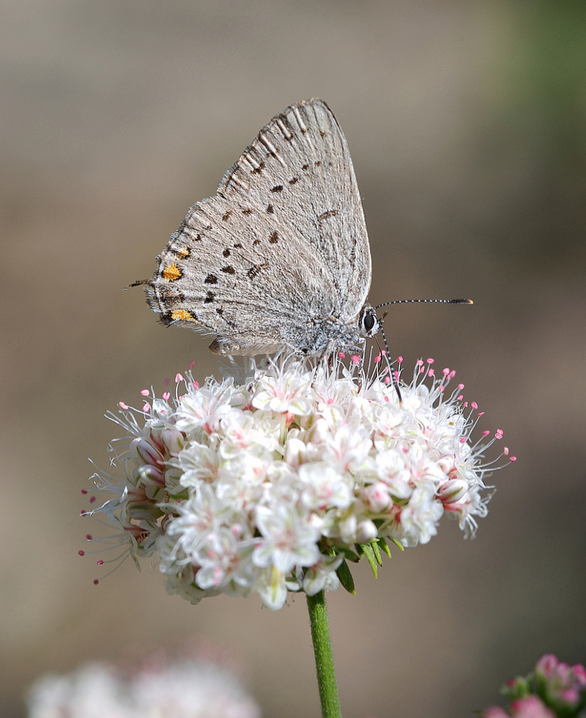 The flowers, leaves and seeds are used by small birds and animals, including deer, as well as by butterflies and bees. Many Native American tribes used parts of the plant for treating headaches, sore throat and diarrhea, and to treat wounds. 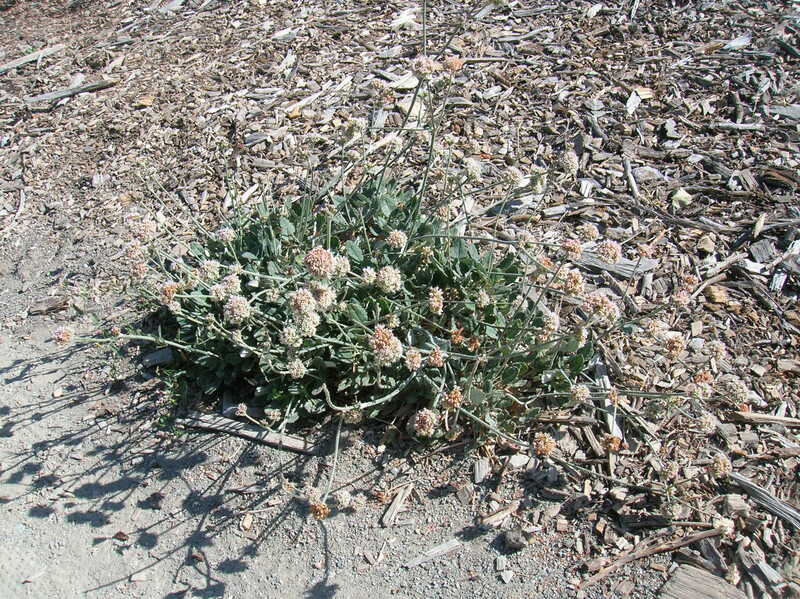 However, it turns out that native California buckwheats happen to be in the same botanical family (Polygonaceae) as the cereal buckwheat, but they are vastly different in appearance and growth characteristics. 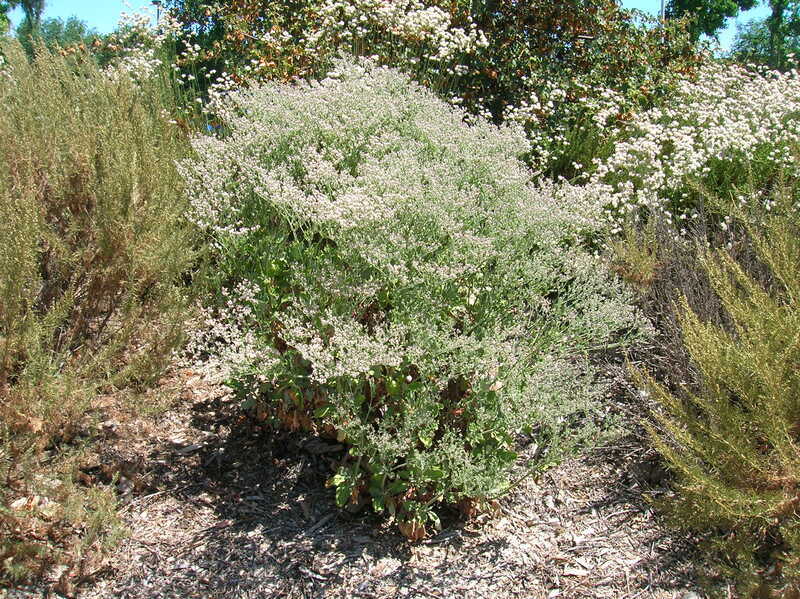 It is usually a medium-to-large shrub, but some varieties grow low to the ground, almost as a ground cover (we have three sizes here at the GNG). The leaves of some species are short and slender, a good design for conserving water during dry months, while others have rounder leaves. In fact, the buck wheats at the GNG, being chaparral plants, get absolutely no water outside of the rainy winter season (assuming we have one). They love full sun, and do perfectly fine in lean soil, such as sand and clay. Here is a photo of one that came up all by itself last year in the dry, gravelly soil along- side the asphalt path, courtesy of a bird, or maybe the wind, carrying the seeds around. We have never given it a drop of water, aside from winter and spring rains. The flowers begin to appear just as the spring flora are turning to seed, taking the form of tight clusters of tiny white or pink blossoms. The blossoms last a long time, turning to chocolate-brown or rust-colored in the Fall; even the dried flowers are attractive, so you might want to leave them on the plant until cleanup time in the Fall. Las Pilitas Nursery reports that they “have had customers remove rose bushes to plant [buckwheats], as it has more flowers for longer with less care and watering.” They require very little care; leave the faded flowers on until new leaves begin to appear, or when the rains start, then just clip off the flower stalks back to the new leaves. 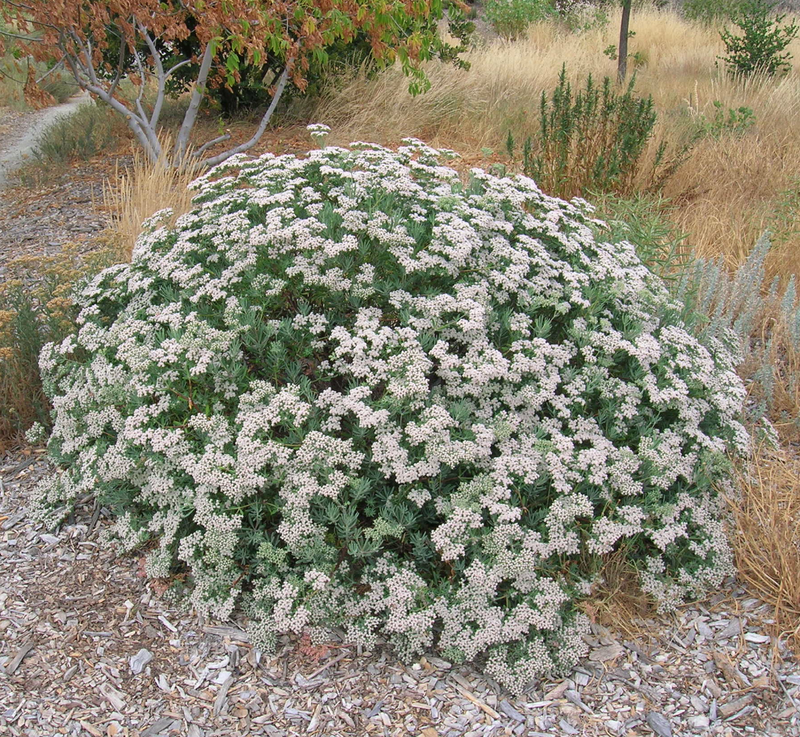 • Four varieties of buckwheat (Eriogonum spp.) are in bloom, attracting lots of bees and butterflies. We have placed identifica- tion markers at some of them. You can lift the markers off their posts and find out more about each one, then replace the markers (as long as none of the ID markers mysteriously disappear overnight, which they tend to do). • The golden poppies are gone, but they have been replaced by the golden fields of purple needlegrass (Nassella pulchra, the official California state grass, by the way) at the south and north ends of the GNG. 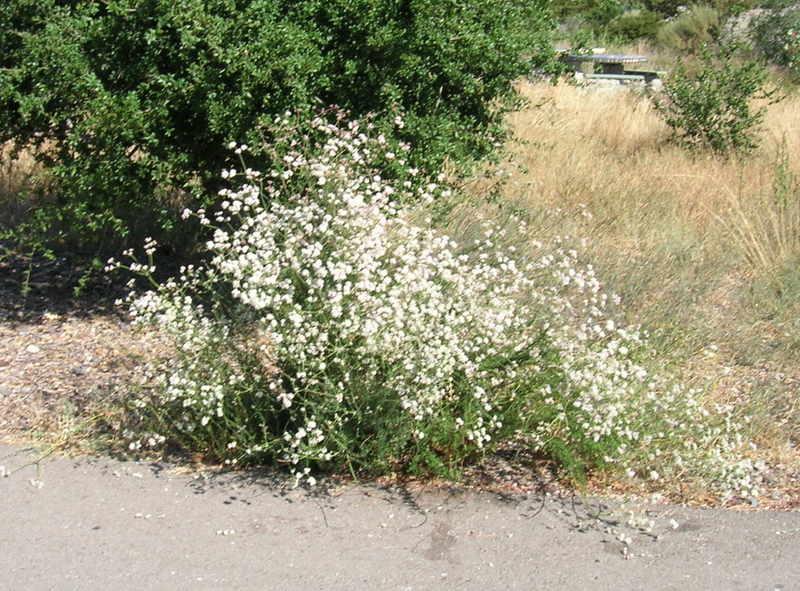 • The native roses (Rosa californica) that were in bloom last month have shed their petals, but the stems are full of rose “hips”, which are the little round fruits that the blossoms develop into. • Our buckeye (Aesculus californica) looks dead, but it is only aestivating — the opposite of hibernating. It will bloom again next Spring. Look for the big “dead” tree with an ID marker. • Next to the buckeye is the toyon (Heteromeles arbutifolia), full of berries that will turn bright red just in time for Christmas! Come back then for another look. • At the other end of the Garden, the elderberry (Sambucus mexicana) is in full flower, and berries are starting to form. Each winter we cut it back to almost nothing, but obviously, it doesn’t mind, because you will see how big it gets after just a few months. • July is the month when the little, bright red hummingbird fuchsia (Epilobium canum) begins to blossom. It is hard to find, but unmistakeable once you do find it. We will try to add more of it over the next few years. • The native grapes (Vitus californicus, Roger’s Red variety) are trying to take over the Garden, but we won’t let them! • Western fence lizards (aka “blue bellies”) are scampering all over the place, looking for bugs. “Tribulus” could spell trouble, literally. 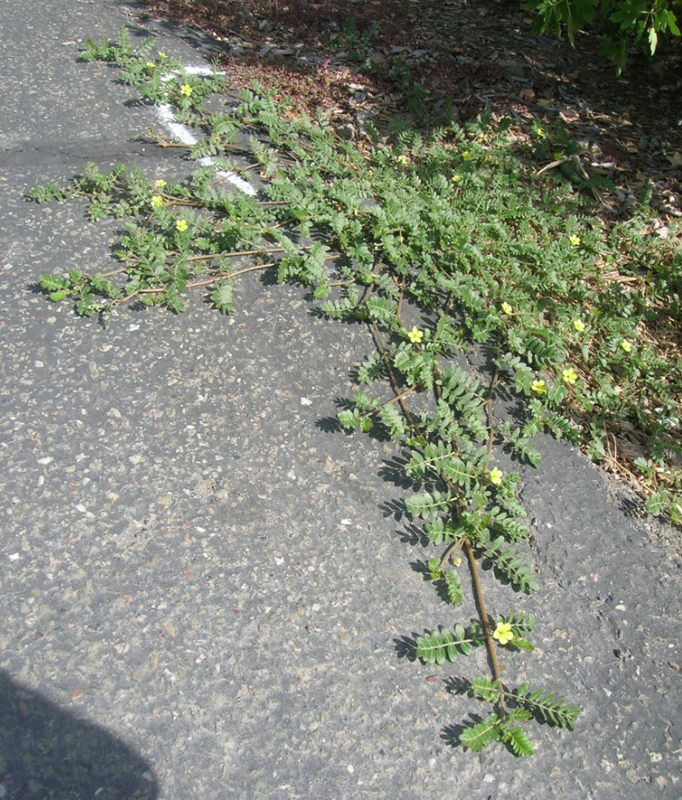 Tribulus terrestris, that is, also known as puncture vine. Actually, the name comes from an ancient sharp, spikey weapon of war. 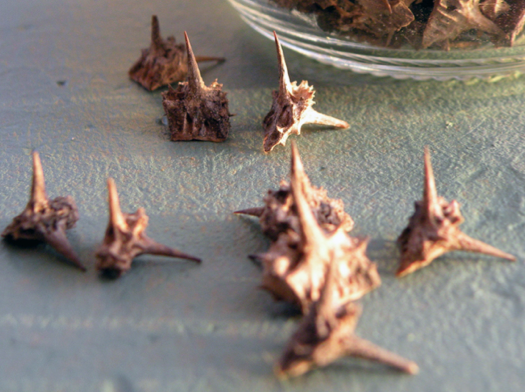 While puncture vine is actually a fairly attractive weed, it hides small nutlets that have two or three very stiff and sharp spines which are guaranteed to puncture your bicycle tire if you drive over them. The stuff takes root in the ground next to the bike path, then spreads over the asphalt and lies in wait. We remove any we find growing along the bike path adjacent to the Granada Native Garden, but that is only a very short segment of the bike trail.